For other people of the same name, see Josiah (given name). Josiah (/dʒoʊˈsaɪ.ə/ or /dʒəˈzaɪ.ə/) or Yoshiyahu[a] was a seventh-century BCE king of Judah (c. 649–609) who, according to the Hebrew Bible, instituted major religious reforms. Josiah is credited by most biblical scholars with having established or compiled important Hebrew Scriptures during the "Deuteronomic reform" which probably occurred during his rule. Josiah became king of Judah at the age of eight, after the assassination of his father, King Amon, and reigned for thirty-one years, from 641/640 to 610/609 BCE. Josiah is known only from biblical texts; no reference to him exists in surviving texts of the period from Egypt or Babylon, and no clear archaeological evidence, such as inscriptions bearing his name, has ever been found. Nevertheless, most scholars believe he existed and that the absence of documents is due to few documents of any sort surviving from this very early period, and to Jerusalem having been occupied, conquered, and rebuilt for thousands of years. The Bible describes him as a very righteous king, a king who "walked in all the way of David his father, and turned not aside to the right hand or to the left" (2 Kings 22:2). He is also one of the kings mentioned in the genealogy of Jesus in Matthew's gospel, one of the two divergent genealogies of Jesus in the New Testament (Cf. Matthew 1:10–11). According to the Hebrew Bible, Josiah was the son of King Amon and Jedidah, the daughter of Adaiah of Bozkath. His grandfather Manasseh was one of the kings blamed for turning away from the worship of Yahweh. Manasseh adapted the Temple for idolatrous worship. Josiah's great-grandfather was King Hezekiah, a noted reformer. Josiah had four sons: Johanan, and Eliakim (born c. 634 BCE), whose mother was Zebidah the daughter of Pedaiah of Rumah; and Mattanyahu (c. 618 BCE) and Shallum (633/632 BCE), whose mother was Hamutal, the daughter of Jeremiah of Libnah. Eliakim had his name changed by Pharaoh Necho of Egypt to Jehoiakim. His youngest son Shallum succeeded Josiah as king of Judah, under the name Jehoahaz. Shallum was succeeded by Eliakim, under the name Jehoiakim, who was succeeded by his own son Jeconiah; then, Jeconiah was succeeded to the throne by his uncle Mattanyahu, under the name Zedekiah. Zedekiah was the last king of Judah before the kingdom was conquered by Babylon and the people exiled. According to the Hebrew Bible, in the eighteenth year of his rule, Josiah ordered the High Priest Hilkiah to use the tax money which had been collected over the years to renovate the temple. It was during this time that Hilkiah discovered the Book of the Law. While Hilkiah was clearing the treasure room of the Temple he discovered a scroll described as "the book of the Law" or as "the book of the law of Yahweh by the hand of Moses". The phrase "the book of the Torah" (ספר התורה, sefer ha-torah) in 2 Kings 22:8 is identical to the phrase used in Joshua 1:8 and 8:34 to describe the sacred writings that Joshua had received from Moses. The book is not identified in the text as the Torah and many scholars believe this was either a copy of the Book of Deuteronomy or a text that became a part of Deuteronomy. 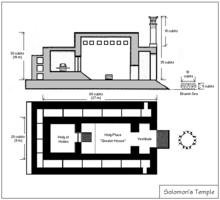 A sketch of the Temple of Solomon based on descriptions in the Tanakh. However it has been noted that the story of the repairs to the Temple is based on those ordered by an earlier Judean king, Joash (who ruled c. 836 – 796 BCE) in 2 Kings 12. Hilkiah brought this scroll to Josiah's attention. Josiah consulted the prophetess Huldah, who assured him that the evil foretold in the document for nonobservance of its instructions, would come, but not in his day; "because", she said, "thine heart was tender and thou didst humble thyself before the Lord". An assembly of the elders of Judah and Jerusalem and of all the people was called, and Josiah then encouraged the exclusive worship of Yahweh, forbidding all other forms of worship. The instruments and emblems of the worship of Baal and "the host of heaven" were removed from the Jerusalem Temple. Local sanctuaries, or High Places, were destroyed, from Beer-sheba in the south to Beth-el and the cities of Samaria in the north. Josiah had pagan priests executed and even had the bones of the dead priests of Bethel exhumed from their graves and burned on their altars. Josiah also reinstituted the Passover celebrations. According to 1 Kings 13:1–3 an unnamed "man of God" (sometimes identified as Iddo) had prophesied to King Jeroboam of the northern Kingdom of Israel (Samaria), approximately three hundred years earlier, that "a son named Josiah will be born to the house of David" and that he would destroy the altar at Bethel. And the only exception to this destruction was for the grave of an unnamed prophet he found in Bethel (2 Kings 23:15–19), who had foretold that these religious sites Jeroboam erected would one day be destroyed (see 1 Kings 13). Josiah ordered the double grave of the "man of God" and of the Bethel prophet to be let alone as these prophecies had come true. Josiah's reforms are described in two biblical accounts, 2 Kings 22–23, and 2 Chronicles 34–35. They began with the ending of ancient Israelite religious practices, and the astral cults that had become popular in the 8th Century, and led to centralisation of worship in Jerusalem, and the destruction of the temple at Bethel. According to the later account in 2 Chronicles, Josiah destroyed altars and images of pagan deities in cities of the tribes of Manasseh, Ephraim, "and Simeon, as far as Naphtali" (2 Chronicles 34:6–7), which were outside of his kingdom, Judah, and returned the Ark of the Covenant to the Temple. When Josiah became king of Judah in about 641/640 BCE, the international situation was in flux. The Assyrian Empire was beginning to disintegrate, the Neo-Babylonian Empire had not yet risen to replace it, and Egypt to the west was still recovering from Assyrian rule. In this power vacuum, Jerusalem was able to govern itself for the time being without foreign intervention. In the spring of 609 BCE, Pharaoh Necho II led a sizable army up to the Euphrates River to aid the Assyrians against the Babylonians. Taking the coast route Via Maris into Syria at the head of a large army, consisting mainly of mercenaries, and supported by his Mediterranean fleet along the shore, Necho passed the low tracts of Philistia and Sharon. However, the passage over the ridge of hills which shuts in on the south of the great Jezreel Valley was blocked by the Judean army led by Josiah, who may have considered that the Assyrians and Egyptians were weakened by the death of the pharaoh Psamtik I only a year earlier (610 BCE), who had been appointed and confirmed by Assyrian kings Esarhaddon and Ashurbanipal. Josiah attempted to block the advance at Megiddo, where a fierce battle was fought and Josiah was killed. Necho then joined forces with the Assyrian Ashur-uballit II and together they crossed the Euphrates and lay siege to Harran. The combined forces failed to capture the city, and Necho retreated to northern Syria. There are two accounts of Josiah's death in the Bible. 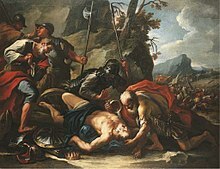 The Second Book of Kings merely states that Necho II met Josiah in battle at Megiddo and killed him (2 Kings 23:29), whereas the second book of Chronicles (2 Chronicles 35:20–27) gives a lengthier account and states that Josiah was fatally wounded by Egyptian archers and was brought back to Jerusalem to die. His death in the latter account was attributed to him "not listening to what Necho had said at God's command..." when Necho stated: "What have I to do with you, king of Judah? I am not coming against you today, but against the house with which I am at war; and God has commanded me to hurry. Cease opposing God, who is with me, so that he will not destroy you." According to 2 Chronicles 35:25, Jeremiah wrote a lament for Josiah's death. The account in Chronicles is considered unreliable by some scholars, as it is based on the description of the death of a different king, Ahab, in 1 Kings, and it meets the Chronicler's religious agenda to attribute the death of a righteous king to some form of sin. After the setback in Harran, Necho left a sizable force behind, and returned to Egypt. On his return march, Necho found that Jehoahaz had been selected to succeed his father, Josiah. (2 Kings 23:31) Necho deposed Jehoahaz, who had been king for only three months, and replaced him with his older brother, Jehoiakim. Necho imposed on Judah a levy of a hundred talents of silver (about 3​3⁄4 tons or about 3.4 metric tons) and a talent of gold (about 75 pounds or about 34 kilograms). Necho then took Jehoahaz back to Egypt as his prisoner. The defeat of Josiah at Megiddo essentially represents the end of the rule of the Davidic line, since not only were Josiah's successors short-lived, but also Judah's relative independence had crumbled in the face of a resurgent Egypt bent on regaining its traditional control of the region, and the imminent rise of the Babylonian empire which also sought control. Necho had left Egypt in 609 BCE to relieve the Assyrian Harran under Babylonian siege. Josiah's actions may have provided aid to the Babylonians by engaging the Egyptian army. 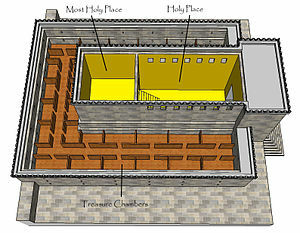 The Hebrew Bible states that the priest Hilkiah found a "Book of the Law" in the temple during the early stages of Josiah's temple renovation. 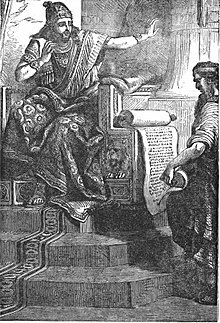 Hilkiah then gave the scroll to his secretary Shaphan, who took it to King Josiah. According to the Bible, King Josiah then changed his form of leadership entirely, entering into a new form of covenant with the Lord. He wiped out all of the pagan cults that had formed within his land. He, along with his people, then entered into this new covenant with the Lord to keep the commandments of the Lord. For much of the nineteenth and twentieth centuries, it was agreed among biblical scholars that this "Book of the Law" was an early version of the Book of Deuteronomy, but recent biblical scholarship sees it as a largely legendary narrative about one of the earliest stages of the creation of Deuteronomistic work. That is, historical-critical biblical scholars generally believe that the "Book of the Law"—an early predecessor of the Torah—was invented by Josiah's priests, who were driven by ideological interests to centralize power under Josiah in the Temple in Jerusalem. Many scholars see the whole core narrative, from Joshua to 2 Kings, as comprising a Deuteronomistic History (DtrH) written during Josiah's reign. In fact, some recent European theologians even go so far as to posit that most of the Torah and Deuteronomistic History was composed and finalized several centuries later, during the Persian period. However, most biblical scholars are coming to believe that the Deuteronomistic History was composed using other earlier sources, including a brief chronicle of king's names, age at the beginning of their reign, and their mother's names. The only textual sources of information for Josiah's reign are from the Bible, notably 2 Kings 22–23 and 2 Chronicles 34–35. No archaeological evidence for Josiah as a person exists. However, a signet ring has been found in the City of David in Jerusalem featuring the name of one of King Josiah's officials, Nathan-Melech, mentioned in the book of 2 Kings 23:11. The inscription of the ring says, "(belonging) to Nathan-Melech, Servant of the King." Though it may not directly mention King Josiah by name, it does appear to be from the same time period in which he would have lived. Seals and seal impressions from the period show a transition from those of an earlier period which bear images of stars and the moon, to seals that carry only names, a possible indication of Josiah's enforcement of monotheism. No other archaeological evidence of Josiah's religious reforms has been discovered. The date of Josiah's death can be established fairly accurately. The Babylonian Chronicle dates the battle at Harran between the Assyrians and their Egyptian allies against the Babylonians from Tammuz (July–August) to Elul (August–September) 609 BCE. On that basis, Josiah was killed in the month of Tammuz (July–August) 609 BCE, when the Egyptians were on their way to Harran. According to Rabbinic interpretation, Huldah said to the messengers of King Josiah, "Tell the man that sent you to me ..." (2 Kings 22:15), indicating by her unceremonious language that for her Josiah was like any other man. The king addressed her, and not Jeremiah, because he thought that women are more easily stirred to pity than men, and that therefore the prophetess would be more likely than Jeremiah to intercede with God in his behalf. Huldah was a relative of Jeremiah, both being descendants of Rahab by her marriage with Joshua. While Jeremiah admonished and preached repentance to the men, she did the same to the women. Huldah was not only a prophetess, but taught publicly in the school, according to some teaching especially the oral doctrine. It is doubtful whether "the Gate of Huldah" in the Second Temple (Middot 1:3) has any connection with the prophetess Huldah; it may have meant "Cat's Gate"; some scholars, however, associate the gate with Huldah's schoolhouse (Rashi to Kings l.c.).E. C. L. G.
The prophetic activity of Jeremiah began in the reign of Josiah; he was a contemporary of his relative the prophetess Hulda and of his teacher Zephaniah. These three prophets divided their activity in such wise that Hulda spoke to the women and Jeremiah to the men in the street, while Zephaniah preached in the synagogue. When Josiah restored the true worship, Jeremiah went to the exiled ten tribes, whom he brought to Israel under the rule of the pious king Although Josiah went to war with Egypt against the prophet's advice, yet the latter knew that the pious king did so only in error; and in his dirges he bitterly laments the king's death, the fourth chapter of the Lamentations beginning with a dirge on Josiah. ^ Wells, John C. (1990). Longman Pronunciation Dictionary. Harlow, England: Longman. p. 386. ISBN 0-582-05383-8. entry "Josiah"
^ a b Alpert, Bernard; Alpert, Fran (2012). Archaeology and the Biblical Record. Hamilton Books. p. 74. ISBN 978-0-7618-5835-5. ^ Person, Raymond F. (2010). The Deuteronomic History and the Book of Chronicles: Scribal Works in an Oral World. Society of Biblical Lit. ISBN 978-1-58983-517-7. ^ a b c "Josiah", Jewish Encyclopedia (1906). ^ Encyclopaedia Judaica (second edition, vol 11) pg. 459. ^ Gordon D. Fee; Robert L. Jr. Hubbard (4 October 2011). The Eerdmans Companion to the Bible. Wm. B. Eerdmans Publishing. p. 258. ISBN 978-0-8028-3823-0. ^ Mendenhall, George (September 1954). "Covenant Forms in Israelite Tradition". The Biblical Archaeologist. 17 (3): 73–76. ^ "The Book of Josiah's Reform", Bible.org. Retrieved 24 July 2011. ^ Grabbe, Lester L. (2016-12-01). 1 & 2 Kings: An Introduction and Study Guide: History and Story in Ancient Israel (1 ed.). T&T Clark. ASIN B01MTO6I34. ^ Borschel-Dan, Amanda. "Tiny First Temple find could be first proof of aide to biblical King Josiah". The Times of Israel. The Times of Israel. Retrieved 2 April 2019. ^ a b Finkelstein, Israel; Silberman, Neil Asher (2001). The Bible Unearthed: Archaeology's New Vision of Ancient Israel and the Origin of Its Sacred Texts. Simon and Schuster. ISBN 978-0-684-86912-4. ^ Thiele, Mysterious Numbers 182, 184–185. The Bible Unearthed: Archaeology's New Vision of Ancient Israel and the Origin of Its Sacred Texts for the possible role of Josiah in creation of the Bible. Hertz, J. H. (1936). The Pentateuch and Haftoras. Deuteronomy. Oxford University Press, London. Friedman, R. (1987). Who Wrote the Bible? New York: Summit Books. Wikimedia Commons has media related to King Josiah.